Are you fed up of gazing over your immaculate lush green lawn only to have your joyous viewing pleasure interrupted by horrid round brown patches? Those would be “lawn burn” patches that appear when your dog urinates all over the grass. 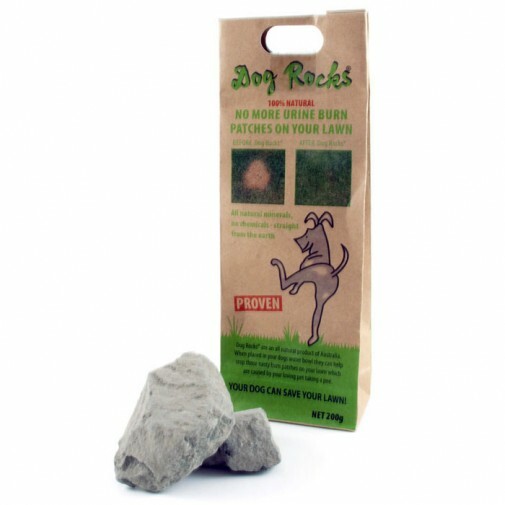 Dog Rocks are igneous rocks mined in the depths of Australia, which makes them a 100% natural remedy to making your dog’s urine less harmful to your lawn. For those who prefer to take the natural approach to dog ownership, this is a very appealing product. These igneous rocks have a very handy habit of filtering out impurities from water such as tin, ammonia and nitrates. All three of these delightful impurities have a not so handy habit of “burning” your lawn when your dog needs a loo break. Dog Rocks are rinsed under the tap and then placed in your dog’s main source of drinking water – such as the water bowl. It is recommended that you persuade your dog to drink from other sources as little as possible as this can dilute the effects of the Dog Rocks. A great tip for those with slightly more enthusiastic dogs, it is recommended that the rocks be placed in a jug and their drinking bowl be topped up from this. Doing this will reduce the likelihood of the rocks being pinched straight out their bowl and ending up buried in the garden! The full effects of the Dog Rocks can take up to 5 weeks to become apparent, and each pack lasts around two months which means you have two months of – hopefully – greener lawns before you need to replace them.